This entry was posted in 2012 and tagged 2012, ed, fran, tim. Bookmark the permalink. No! I don’t want the writing insanity to end just yet. November is my favorite month of the year (all because of NaNo), and I hate to think it’s almost two-thirds over. But at least it’s been a good month so far (I’m on track to hit 50k tomorrow…or, I guess much much later this evening, since it’s past midnight here). Fingers crossed for you hitting 50k soon, Takayta! I wonder how Dave feels about Vicky be flirted with every guy she meets. Noooo! One more weekend left. 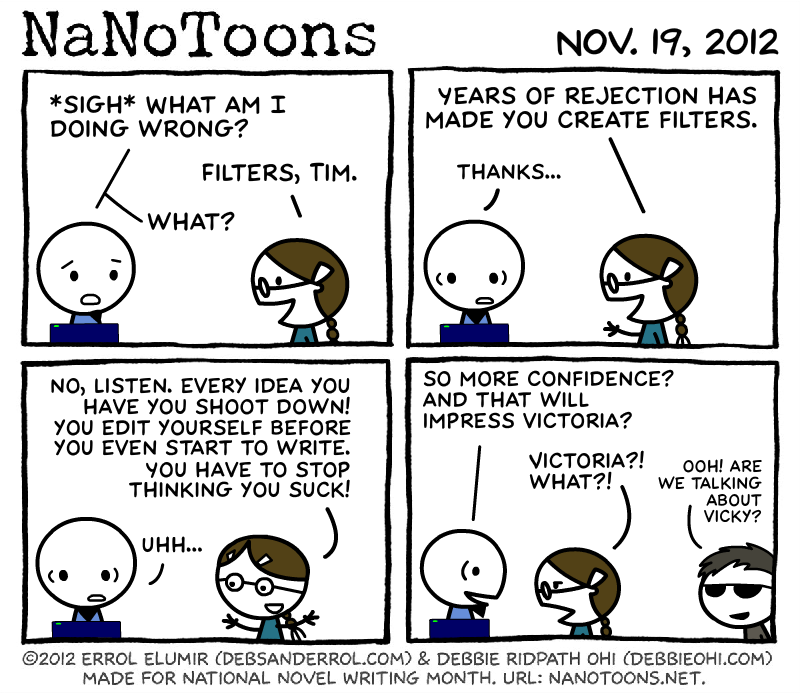 I don’t know How I’ll survive without NaNoWriMo. ast year I came back to check this site constantly when NaNoWriMo was out! I will surely Not survive! 😀 Glad you’ve been enjoying these comics, Annie!